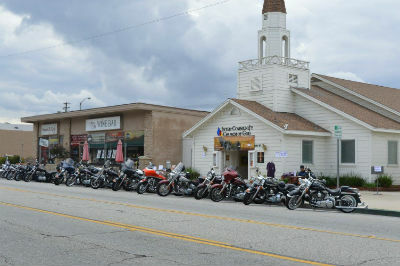 Photo: Bikes lined up for a blessing of the bikers at the church. “I pray that as soon as he’s back to his senses, he would understand that what he did was not just because of him. I pray that God would visit him with someone who is able to lead him to a saving knowledge of Jesus Christ. I pray that he would know that though his actions have consequences, his soul is still valuable.” Pastor David Collett’s words echo an extension of grace and forgiveness, remarkable considering his prayer is for the perpetrator of assault against him. The few weeks that have passed since the incident took place during a Tuesday night Bible study have proven restorative—not only physically, but spiritually, too. Though the pastor of Inter-Community Church of God in Covina, California, is still recovering, he will not be deterred by hell’s attacks. His resolve to thwart hell’s advances and redeem what hell has stolen couldn’t be stronger. There was no gun involved, no deaths, and this happened at a small church in a suburb of Los Angeles, so there has been no news coverage on the event I share here. On May 24, at the close of Biker Bible Study as we were praying, a young man came in who was obviously in trouble–completely cranked up on drugs and who knows what. In the process of trying to settle his disruptions, it was clear I was dealing with more than “flesh and blood,” and began to admonish him in the name of Jesus Christ. The spirit in him did not like the Spirit in me, and I was suddenly struck in the face with a tremendous blow. I heard the cracks, went down stunned, and after trying to attack another man with me, he raced out. He was arrested shortly after our 9-1-1 call. 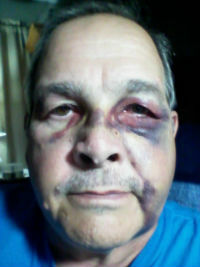 Photo: David Collett’s bruised face. Inter-Community Church of God isn’t often in the crosshairs of criminal activity, though the church does sit in the heart of the densely populated Los Angeles metro area. Instead of running from the problems of their neighborhood, they’ve learned to embrace them. For example, the church has boldly welcomed the homeless to sleep in the shade—or the warmth—of the church property. Some of these homeless have even served as voluntary watchdogs for the church. People know the church is there for this community, and though it has been messy at times, the church is resolved to be the hands and feet of Jesus. Photo: David with his wife Bobbi. 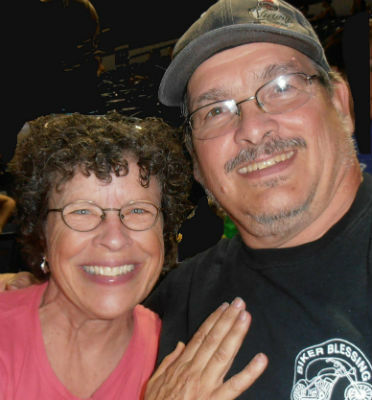 Following surgery on June 3, Dave is on the road to a successful, though painful, recovery. He won’t do too much preaching or singing the next few weeks, but of his facial injuries, he still managed to find some humor: “For the most part, I’ll still look as bad as I always did!” he exclaims. Please continue to pray for Pastor David and Inter-Community Church of God. Thank you! This entry was posted in All Church of God, Western. Bookmark the permalink.